Krystal who wrote, "The booties are so adorable! They seem like the perfect thing to knit up and then have ready when a baby gift giving occasion sneaks up on me... And I love the French Press slippers!" Amy who posted, "They are ADORABLE! A classic! I hope I win!" And, last but not least, Jodi who commented, "Super cute! Those are going to be great to give as baby shower gifts." Congratulations to the three winners! You will be receiving a copy of the brand spankin' new pattern and a skein of Paton's Classic Wool in the color of your choice. Please send your mailing address and the color that you would like to receive to yarnonthehouse@gmail.com. For those of you who did not win the 3-in-1 Felted Baby Booties giveaway, the pattern has been officially released today. Yay! Here is the link to the Ravelry page. Just like everyone has said, these are going to be a hit at the baby shower! Now, onto this week's giveaway... Guess who's back! A: This question grabbed me because it sort of came up this past weekend while I was attending a political science conference! I don't see myself as anything particularly fancy, but I do believe in the power of human spirit, and the idea of "every little bit" helping. I was at lunch with one of my professors, and we were talking about my "knitting stuff" in general (and my personal struggle in determining where exactly my career path lies). I was really excited to share with her that during the February/March "Help for Haiti" effort, I had managed to raise several hundred dollars by donating a chunk of my pattern sales--that's more than I've ever been able to give during my grad school years! (Mostly because...let's face it, grad students are generally very broke and I am no exception). I've also been excited to donate some knit items to charity auctions, or when other knitter's share with me that they have had success with a donation based on one of my patterns. You know what else I think is special about knitting? I know when I'm working on a project, especially one that my children get to keep, I truly enjoy putting love into every stitch. Even though my boys are too young to consider or acknowledge that, loving a child is one of the most important contributions one can make in any community. So--when I'm writing a new pattern (especially one for children), I also like to think I'm helping someone (whether it be moms/grandmas/good friends or even strangers) love on a little one! A: I had to answer this question because it totally cracked me up! Definitely DPNs. I have only tried Magic Loop once or twice. Also, I really enjoy the looks people give me in public when I am using DPNs. Its like I am a knitting goddess and they can't imagine how things are coming together. I would miss that too much were I to use Magic Loop. A: Most of the time, I start more than 1 if there are either multiple design projects with similar deadlines, or, if I need an easy project to carry with me. I don't generally do a lot of knitting for a new design unless I have decent concentration. But if I am sitting in the doctor's office, or watching my kids at the playground, I'll try to have something I can grab to work on that doesn't require me to be looking at it! A: Frozen with salt! And I like to try many different flavors too. Kate has also started a new thread in her Tottoppers Group on Ravelry for you to be able to ask her whatever your little heart desires. Hop on over there after you're done reading and entering this giveaway! Kate has recently released her really cute Topped for a Year booklet. This booklet includes 12 super adorable hat patterns that you can knit up for all the little ones in your life - one for each month! Kate has contributed TWO Topped for a Year professionally printed booklets for this giveaway. Each winner will also receive a skein of Berroco Comfort, which is enough yarn to make one (possibly even two) little Trail Caps (a fun Spring pattern featured in the booklet). 1) Have an address in the US to ship the yarn to. If you have a friend or relative that has a US mailing address who is willing to be your shipping sponsor, that will work as well. I will send it to them and they can then forward it on to you. 2) Post a comment on this blog post by the end of Sunday, 5/2/2010. Leave a nice comment for Kate to read. Tell her what you think of the new booklet. Again, I'll randomly pick the winners on Sunday and post the results on Monday along with the new giveaway, so be sure to check back. Good luck everyone. Awesome! Thanks for a thoughtful give away, here's to hoping. Love it! Have a copy of my own already, as I pre-ordered it!! So please pass me up if I get picked! Thanks again for a wonderful give away. I hope I win this time!!! Oh my goodness! I LOVE the dinosuar hat! I have 5 nieces with 2 more on the way... I would love to make them in pink, yellow, & purple! What a cute picture that would be!! ROAR! Kate-you might have already answered this, but have you had a pattern that started out as one thing but ended up completely different? Cute hats!! What an awesome give away! I just love giveaways! And that hat is super cute! I love knitting hats! Such a thoughtful giveaway! And a fun project too. Love your hats Kate! I'm hoping to win your booklet, as we're getting quite a few little ones in the family, so it would be fun to make some for them. Thank you for the giveaway. I love all of Kate's designs! Her Mod Circle hat was my introduction to fair isle knitting, and it was easy! What a great give away. I love the design of the book and the patterns in it. It's clear that a lot of hard work went into both. I'm always looking for new baby hat patterns! These are super cute! very nice give away! I love the hats for the little ones... seems most my nieces and nephews are having kids now. it could be a good thing for me to start knitting toppers for them! I am so exited. I have been looking for baby hats for two upcoming showers this summer!! I love the idea of year-round baby hats! I never really understood summer hats for babies until I worked at an amusement park. Babies in hats looked a lot cooler and less squinty than babies without! This would be a great addition to my pattern collection for the grandbabies (even though they don't quite exist yet) It's never too early to start, right? 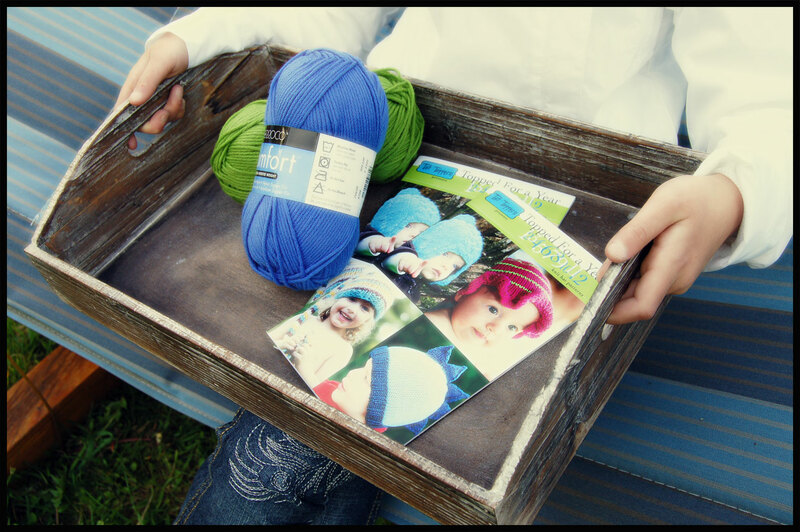 i would love to win this booklet and yarn. my daughter is 15 months and in need of some fun spring/summer hats..
Love the new booklet!! I always love cute patterns for boys, and you never fail to deliver!! 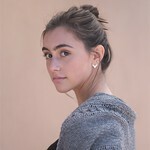 Thanks so much for posting the link to her blog r.e. the design process. I'm very much interested in this! Looks like a great book and yarn combo too! I love that cute dino hat for little boys. So cute! Those hats are so adorable!! This would be perfect for all the baby showers I've got coming up. That booklet looks wonderful. I think your designs for children's hats are fun and classic. Good luck with the booklet! Chunky Striped Stocking Prop Hat -- the photo of the baby modeling it just makes my heart melt. 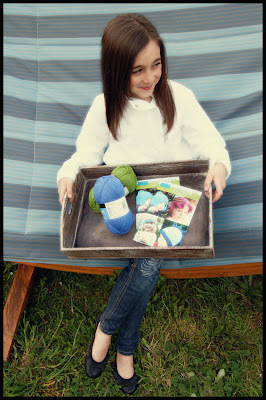 And speaking of cute, just have to say that your model holding the giveaway prize is quite a cutie too! Kate, Love the new booklet. Hope I win! These hats looks like a ton of fun to wear and to knit. I appreciated the answers to whacky questions, made my afternoon on a day I really needed it! I love to make hats! They're so easy to bring with me when I travel. I hope I win this time! The hats are very cute! They look like they would be fun to make. I love her hat patterns! They are so cute and there seems to be something just right for every little one! I love her hats!! Especially as a mom of a 2 year old, I am especially drawn to them. Instant candy for knitters...knitting for tiny ones. What a great book to win for this. Ooh, I love that sunny textured cap, and my kids would love the dinosaur one! Adorable hats! Would love to try some of them! What a great giveaway also! Too cute! I absolutely love cute little hats! I have suddenly been only wanting to knit baby things so this is perfect. Thanks for answering the questions Kate. I love learning new things. I love reading interviews. She sounds like a really cool lady! I would love to try some new yarn. My yarn store won't be carrying it until the fall! :[ Hope I win! What a great idea - I am always on the lookout for new knitting patterns - especially ones for kiddies. I've got my fingers crossed that I win. Thank you for the giveaway. My 2 little boys would look great in matching dinosaur hats. Such cute hats. I would love to make them for my 15 month old. Awesome collection! Great give away. Thanks for the giveaway. If I win this, I am going to freak out. I love Kate's patterns. Keeping my fingers crossed. What a fabulous giveaway! I absolutely love knitting hats. Especially for little ones. They are such a fun knit up, and go pretty quick. 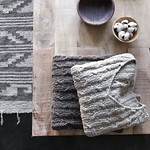 I am anxious to see Kate's booklet (patterns) and am looking forward to trying a couple. :o) Thanks Kate, and thanks, Ve!! 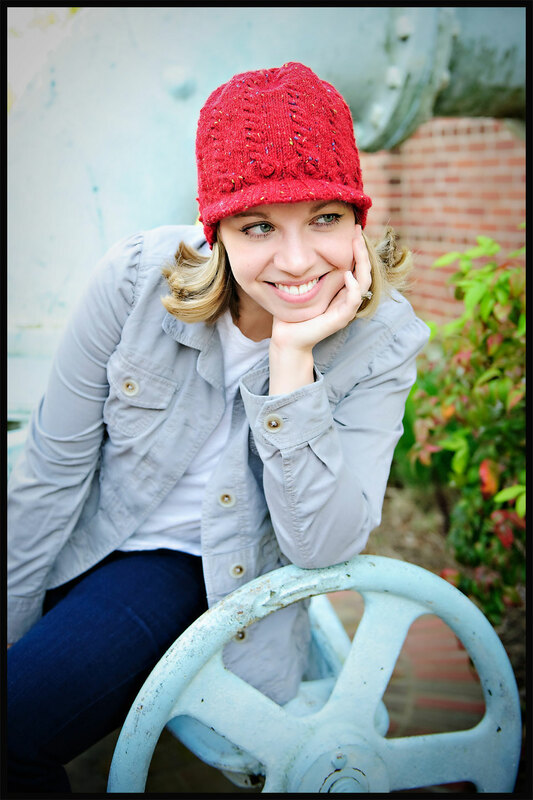 I love to knit hats...they're the perfect portable project! The cabled earflap hat looks warm and stylish! Thanks for answering my question, Kate! I agree- knitting spreads the love and makes our world just a bit kinder and gentler. The Topped For a Year has such cute patterns- The Charlotte's Web hat is particularly unusual, would be great to pair it with the book as a special gift. Soooo cute!! I just love these little hats. Popped over to Ravelry to look at the patterns - so cute!! What a great collection. Your patterns are absolutely adorable! I checked them out at Ravelry already. That looks like a lovely booklet! Thanks for the chance to win!! What could be cuter than kids' hats? Nothing. I just really enjoy Kate and would look to get my hands on the booklet! Okay, I already love all the patterns! whoot! I see there's a pic of a dinosaur hat. I need to have that pattern!! My nephew's favorite animal is Godzilla. He's two. I love Kate's patterns, and am working on a Dindy beret in an ice blue right now. I really like the fact she designs for children and adults! How super cute these are! I have at least three that I would love to see on my baby. I love the idea of a booklet. It's easy to bring places instead of a heavy hardcover book! THanks agian for visitin us on Yarn on the House - love your toppers! I have an 11 yo who just loves hats - I've knitted her 4 diffrent ones this year btw - sometimes I mkae the toddler ones larger and sometimes the adult ones smaller. Have you ever thought of trying to design hats for older children/teens I find this is the hardest group to find great patterns for! Luckily I have a beautiful goddaughter and cousins having babies that I can knit hats for all the time! So count me among your fans. How terrific! I love Tot Toppers - such cute hats for little heads. :) I would love to have this booklet! Thanks for a wonderful giveaway. I make hats for charities. I am working on a child's chemo hat now for a charity. I really enjoyed reading this interview. Thanks for keeping things interesting. Oh wow! I LOVE hat patterns! I have been making hats for almost a year now...so addicted! =) I would love the opportunity to try these patterns! PS: I love frozen margarita's with salt too! With 2 little ones at home I LOVE knitting baby and kid hats. Looks like a great book! I have not seen this yet but have seen your designs, always wonderful! Would be so fun to play! I love to knit hats. I am so excited for the chance to win. I also love Kate's generous nature. Way to use your knitting talent for charitable causes! I love knitting hats and I've been drooling over these patterns for a while now. Oh, these hats are darling! I especially love the dino hat. I just found out that my cousin is pregnant and would love to knit that for the little one! I must have that cabled tweedy topper! It's stinkin cute! I have three baby gifts to knit...need this! Love the Tottoppers and looking forward to seeing Kate's work at SAFF this year. I would love to knit these patterns! Pick Me!! Looks like a great booklet! I love all of the hats, and would love to try making the ruffled striped hat. Kate - I am so impressed with your professionalism of your books and work - keep up the great work and thanks for the terrific patterns!! (also loved the answer to the DPN/Magic loop Q)!! Very cute hats! My favorites are Sunny Textured Cap and Chunky Striped Stocking hat. Those hats are so very cute! My children's friends are having babies and I have two adorable nieces who ask for something soft made just for them, so these would be perfect all around! Thank you for your generous give away. Hats are a favorite of mine to knit...gifts for all! Wow - there's enough adorableness in there to keep me busy for a while & to make prepping for a baby shower that much more fun. The booket looks wonderful and the hats are absolutely adorable. I am so happy that there are designers that make my knitting caps for charity so much fun to knit and donate. This giveaway would provide a couple more. Would love to be able to pass them on. The dinosaur hat is a "must" make hat! Thanks for your generous giveaways! What a delightful booklet! Great idea... and great contest! Wow, I just love the photographs in this post ... they are simply lovely. Thanks! What adorable patterns. I love hats, and especially on kids. They are such nice little projects because they go so fast. First, I must say that I think you are a very pretty woman. Second, What makes you write your patterns? What inspires you? Super cute hats in this booklet!! Love the Bumblebee trail cap! Thanks for offering it! What a great give away! Love the book and would love to try that yarn!! !Oh and 13 is my lucky # fingers crossed!!! These look really adorable. I am a grandmother who loves to knit for my grandchild. Glad to know about this site. hats . 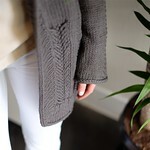 . . one of my favorite things to knit! please include my name in the drawing - thanks. It seems that everyone is having babies (and that other babies are growing up so fast). Such a lovely pattern booklet would really help me keep up with those kids! Thanks again for such a great giveaway!! I love Kate's hats and follow her work on her Ravelry page. Thanks for the give-away! I knit almost all my baby stuff in Berocco Comfort too! I will be making some of those cute hats in the near future, for my nieces!! what beautiful finished objects! Hope I can win some of that great yarn! Thank you for the chance to win. I love knitting little hats and have several that I need to knit for upcoming babies in the family. Would love to knit some of these patterns. Kate~ I'm in total agreement with you about the knitting goddess comments. DPNs in public have always gotten me many incredulous stares and comments. It cracks me up! Love the hats!My daughter would love any of them in pink!